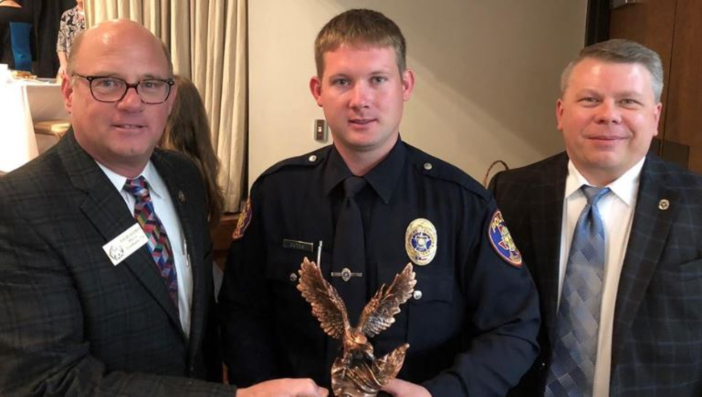 Texarkana Texas Police officer Austin Butts has been named 2018 Officer of the year at the 38th Annual Rotary Law Enforcement Luncheon. Officer Austin Butts was recognized today as our 2018 Officer of the Year at the 38th Annual Rotary Law Enforcement Appreciation Luncheon. He was selected by his fellow officers for his outstanding job performance throughout the last year. Austin started working for us in 2016 after finishing his bachelor degree in criminal justice at Texas A&M-Texarkana. He is a 2009 Texas High School graduate. Please help us congratulate him on this well deserved honor. Thank you to the four Texarkana Rotary Clubs for coming together to do this every year for all the area public safety officers. We also want to thank Arkansas Attorney General Leslie Rutledge for providing the keynote address.